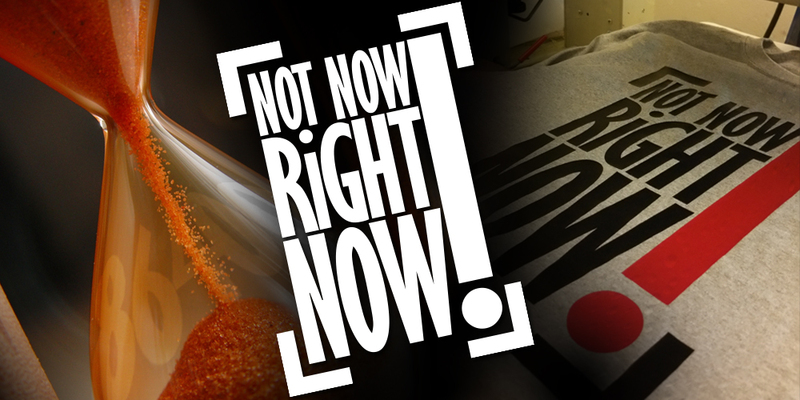 DiZMAJiZ | NOT NOW RiGHT NOW! 07 Apr NOT NOW RiGHT NOW! I was asked “why did you create the design NOT NOW RiGHT NOW!”? With God’s blessing, each day we live we get 24 hours but what truly separates us is how you use your 86400 seconds [24 hours]. As we live our lives, we take for granted how blessed we are to be here in this moment. TIME is your most precious asset. As much as some of you would like to believe it is money, health, or family, it is time. Time is required to achieve everything. If you intend on earning money, you need time to work so you can earn your wages. If you want to get your health right or maintain your health, it requires time to achieve this goal. So when you realize the importance of time, you should be analyzing those 86400 seconds and maximizing them to the fullest. 4 hours! You pretty much have 4 hours to get all the stuff done that you woke up thinking about today. These 4 hours are not in a nice bundled time slot. They are usually all over the place. You might get 10 minutes here or 15 minutes there. This is not only today but about 80% of your time is like this. So at what point do you start being serious about the importance of your time. Do you continue to waste time reading and posting the latest non-sense on your favorite social network? Do you keep arguing with someone over what happened yesterday? Do you continue saying I will do it later? But hey you have all the time in the world right? So why did I create the design, because the time is NOT NOW but RIGHT NOW!